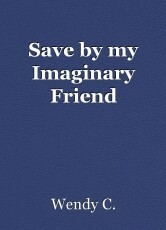 Save by my Imaginary Friend: Chapter 10, book by Wendy C.
Cassie came walking in. “Do not worry Kyle. Kevin does not know where Emily is,” Cassie says. “Do you know where Kevin is?” Kyle asks Cassie. “No, I do not know I just know Kevin does not know where Emily is. I went to see Emily and I do not see Kevin there. I do not think Kevin is planning on kidnap Emily because Kevin is homeless. I think Kevin will change identity and get a job. When he makes enough money he will buy a house and then Kevin will make plans on kidnap Emily. Kyle heard the phone ring. “Hello, who is this?” Kyle asks. “This is Kevin Crumb,” Kevin says. “What do you want Kevin?” Kyle asks. “I just want to tell you I am going to leave Emily alone because I thought of what Jordan said to me. Jordan was right Emily deserves to be happy,” Kevin says. “Kyle, he lying hang up the phone,” Cassie says. “I do not believe what you saying, Kevin because I think you are lying. Kevin Stop lying and turn yourself in and leave Emily alone,” Kyle says. “What is going on?" Cassie?” Kyle asks. “Kevin is planning on kidnapping Emily and some other kids. I just have a vision when I touch the phone,” Cassie says. “I thought you say that Kevin does not know where Emily is,” Kyle says. “Kevin does not know where Emily is right now but when he turns into the beast he will be able to track her. It will not do any good on hiding her again. Kevin’s personalities are getting smart because they want to use the beast to track Emily. We have to get to Emily before Kevin does,” Cassie says. Emily continues getting ready for the party when she heard Kate’s driver pull up to the driveway. “Hey, are you ready Emily?” Kate asks. “Yes, let go,” Emily answers. “We are going to pick up Candy,” Kate says. Candy got into the car with her gift. “Is the party going to be in your house, Kate?” Candy asks. “No, we are having the party at The Plaza Hotel,” Kate answers. “That sound fun Kate. "What do you have for the entertainment?” Emily asks. “The hotel has a movie theatre and we going to watch all the Lord of the Ring movies,” Kate says. “Kyle, you have a phone call,” Lisa says. “Hello,” Kyle answers the phone. “Kyle go check Facebook and look up Kate Brown,” Shawn order Kyle. Kyle looks up Kate Brown on Facebook and saw Emily pictures on Facebook. “Lisa do you know Kate’s driver’s phone number?” Kyle asks. “Yes, I do,” Lisa answers. “You need to call the driver,” Kyle order Lisa. “Hey, Ted this Lisa I am Emily’s aunt. Are the girls ok? Lisa asks. “That not Ted the driver. Kevin killed Ted. Kevin has already kidnapped the girls,” Cassie told Kyle. Kyle told Lisa to call the police. Kyle calls Shawn, Jason, David, and Jordan. It has been hours since Lisa spoke to Kevin. The police already arrived. “Ma’ma, I afraid we have some bad news your daughter and her friends are dead. Ted Blade loss control of the car and fell off a cliff. The car explodes killing everyone in it,” The police told Lisa. Emily and her friends were afraid. “Kevin, how did you find me?” Emily asks. “I will always know where you are. Do you really think that you can hide from your father,” Kevin says. “Where are we going, Kevin?” Emily asks. “We are going to our new home and no one will be able to find us,” Kevin says. Emily was hoping Cassie would find them but she has not heard from Cassie for a while. “You ruin my birthday and make me miss my birthday party you psycho,” Candy told Kevin. Kevin turn around as Dennis and grab Candy. “You better shut up!” Dennis yells. Candy start crying. “It ok Candy just do what he said,” Emily said.